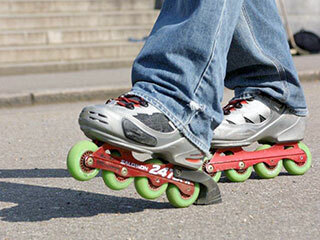 Never skated before and scared of injury by falling? 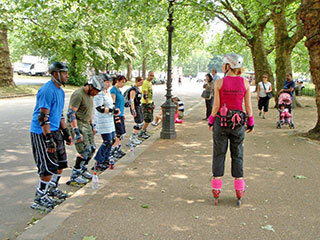 Skated years ago and want to start again? Feel that you might be too old to learn a new sport? Can skate a bit but can’t stop? THIS 3-HOUR BEGINNER GROUP CLASS IS FOR YOU! 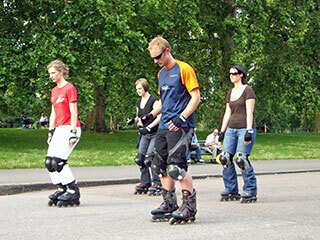 Avoid injury and embarrassment by learning with a professional instructor. 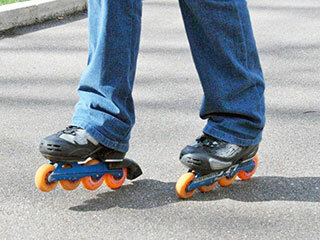 Learn to skate safely without falling. Learn to skate forwards, stop and turn in your first lesson. Improve your confidence so you can practice what you learned without fear. Please click on the lesson you wish to book below and complete the booking process. The Beginner class starts on the grass where you will learn all the basic positions and go through the safety stuff without your wheels rolling around! 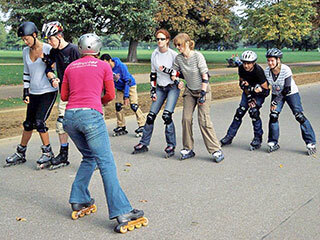 You will learn all about your protective gear, how to fall correctly, how to prevent falling and how to skate absolutely right so that falling happens infrequently. 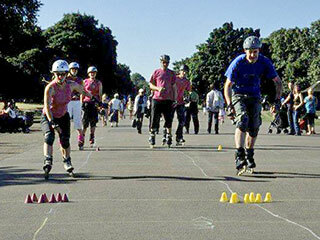 Learning to skate should not be ‘trial and error’. It’s all about physics, motion and gravity and we will teach you about it all so that you learn to progress smoothly. We focus on getting you rolling and teaching you to master the heel brake stop (which isn’t the easiest thing when it’s all new). 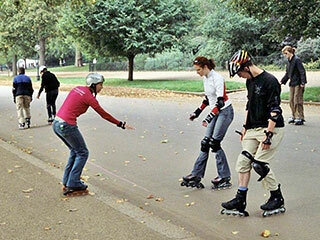 We will also cover turning so that you’ll be fully manoeverable and able to skate, stop and turn. You will then have everything you need to practice on your own and continue improving after class. 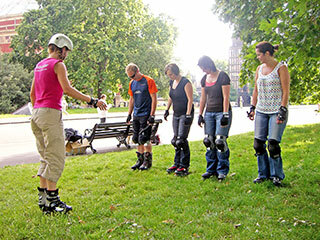 If you are very anxious about skating or very fearful of falling over, we recommend a private lesson for your first time on skates. This will allow you to go at your own pace and fully digest the information being given, while your instructor will continually focus your attention where it is needed, thus reducing the possibility of falling. We teach the same methods in a private or group lesson, the only difference is having an instructor’s eyes only on you rather than shared by a group. Group classes are longer to allow practice time in the class and this is the main advantage of a group class, that after 3 hours most people are really starting to ‘get it’. After completing our Beginner lesson, most people with some practice then continue to our Improver class. Others may feel that they need more help with the basic skills and opt to repeat the Beginner class. Do you need some urgent help with your skating? 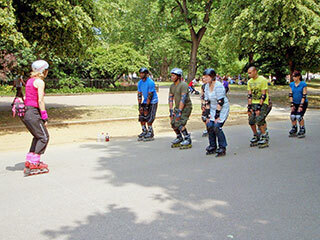 Check out Asha’s free mini tutorials for help with heel braking and skating faster, especially for beginner and improver skaters.